Here’s a somewhat under-appreciated China story: the rest of the globalized, digitalized world can’t have enough of locally made goods, thanks to the planet-wide reach of cross-border e-commerce platforms, including those based in the country. This story is not exactly a sequel to the one about China having been the world’s leading factory for manufactured goods over the last few decades. It is not about leading Chinese tech brands such as Xiaomi, Huawei, Vivo and Haier that are well known outside the country either. Instead, this story is about little-known but globally successful Chinese brands and companies such as Ecovacs. This story is also about virtual Silk Road, a digital highway that enabled China-based cross-border e-commerce platforms in multiple languages to export Chinese goods worth 903.5 billion yuan ($140 billion) in 2017 to more than 200 countries and regions, serving more than 100 million consumers. It is about ambitious business targets: A single e-commerce platform expects to serve 1 billion overseas consumers and 1 billion domestic buyers by 2025. Welcome to the amazing, efficient, logistically-wondrous world of Chinese cross-border e-commerce. In this world, local brands may not boast glamour, but command reach and sales that could stoke both envy and awe in marketing giants. Ecovacs illustrates the point nicely. The company makes robot vacuum cleaners. It is reaping handsome gains from overseas markets. It receives orders from US consumers via Amazon, a global e-commerce titan. On Nov 24 last year, during the Black Friday shopping carnival, hourly sales reached a staggering 1,000 units. That record earned Ecovacs fourth rank among overall household product sales. Qian said Amazon offered Ecovacs helpful guidance on consumer demand analysis based on accurate data. It also imparted professional training in operations and taught market expansion strategy. Like Ecovacs, tens of thousands of China-based vendors now sell their products globally through Amazon Global Selling, a mechanism that leverages the online marketplace’s branches in 10 countries, including the United States, the United Kingdom, Germany, Canada, Japan and Australia. This helps build visibility for their brands globally. A virtuous cycle ensues: brighter brands generate higher sales; next, greater consumer expectation prompts the brands to invest in R&D and improve the quality of their products; this, in turn, encourages firms such as Amazon to launch plans like “service+”, a program to impart Chinese sellers lessons in the art and science of cross-border e-commerce. Thanks to e-commerce, small and medium-sized Chinese firms now receive consulting services for enterprise development strategy and operating model, as well as tailor-made solutions for business expansion at different stages. “China’s cross-border e-commerce is thriving, which brings about huge opportunities for Chinese enterprises. But, it also brings about new issues and challenges. By leveraging Amazon’s global network and resources, we could provide customized solutions to meet the needs of Chinese sellers and cultivate cross-border e-commerce talent in China,” Dai Jingfei, vice-president of Amazon China, said. In 2017, sales revenue from third-party sellers on Amazon’s online marketplace accounted for 50 percent of global sales, among which the SMEs accounted for over 25 percent of Amazon’s overall third-party businesses. More than 15 percent of Chinese consumers made purchases worth $85.76 billion from cross-border e-commerce platforms in 2016, according to consultancy eMarketer. By 2020, a quarter of the Chinese population, or more than half of all digital buyers, will be shopping either directly on foreign-based websites or through third parties. Meanwhile, China-made smartphones, PCs, electronic accessories and household supplies are proving to be the most favorite products among overseas buyers, industry reports showed. For instance, Chinese earphone maker Bluedio sells its products worldwide via AliExpress, Alibaba Group Holding Ltd’s business-to-customer or B2C website that serves foreign users. “The sales on Singles Day (on Nov 11 last year) surged about 120 percent compared to the previous fest. AliExpress is a good starting point,” said Li Jiacheng, marketing head of Bluedio. He said the company set up a 30-member taskforce to pursue R&D for critical technologies. At present, AliExpress serves 224 countries and regions around the world with more than 100 million overseas buyers. Its content is available in 18 languages, including Russian, Spanish and French. “In the past, Chinese merchants were serving intermediates, and had no say in pricing power, but now they can participate in international competition under a transparent and fair environment created by cross-border e-commerce platforms,” said Shen Difan, general manager of AliExpress. By 2025, Alibaba expects to serve 2 billion consumers worldwide, among whom 1 billion would be overseas users, according to Shen. The top three countries ranked by total spending on AliExpress are Russia, the US and Spain. AliExpress hopes to foster 1,000 merchants whose monthly sales in cross-border deals surpass $500,000 each. Meanwhile, Cainiao Network Technology Co Ltd, Alibaba’s logistics arm, is reshaping the logistics landscape in Russia, through its first international air freight service from Hangzhou to Moscow, which was launched in March. Cainiao is on course to help reduce delivery time worldwide to 72 hours within the next five years. JD, another e-commerce behemoth, rolled out its cross-border B2C platform in 2015, with Spanish, English and Russian versions. The platform aims at helping Chinese companies’ quality products and well-known brands to reach international markets. JD opened its Spanish website in April to target Spain and Latin America, serving 400 million Spanish-speaking people. 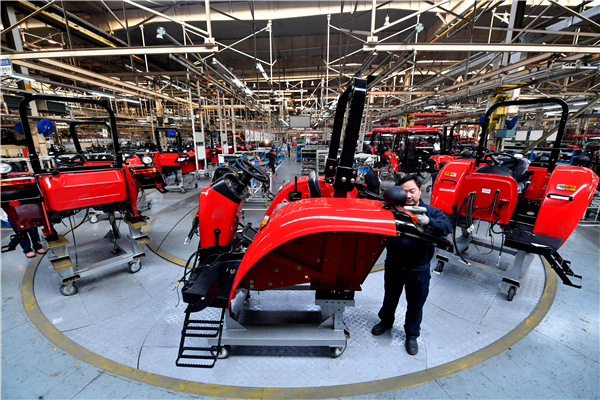 JD said it will enter the markets through investments in logistics, goods and services, and by integrating its capabilities in China’s commodity supply chain, to provide quality products to Spanish customers. JD will offer 100,000 popular items in partnership with 1,000 partners, including smartphone maker Nubia, electronics manufacturer Rappo, robotic vacuum cleaner maker iLife to expand in the Spanish-speaking markets, said Liu Qiangdong, chairman and CEO of the company. It also promised a two-to three-day delivery timeframe for premium packages and seven-to 20-day delivery for economy packages in Spain, with a plan to set up local warehouses within this year. “However, domestic cross-border e-commerce platforms may face some difficulties in logistics, delivery, local laws and regulation restrictions when exporting products,” said Wang Xiaoxing, an analyst with the Beijing-based internet-driven consultancy Analysys.